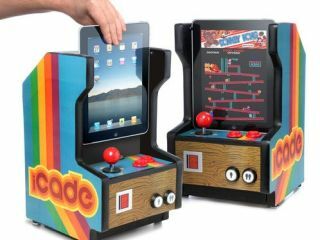 Will an intrepid gamer's mock-up of an 'iCade' style arcade cabinet for iPad persuade Apple to follow suit? What started off as an April Fool's gag, the iCade arcade case for the Apple iPad, could well soon become an actual item for sale to iPad owners. An intrepid iPad gamer has posted videos of a more 'home made' arcade cabinet style device showing how Apple might be able to develop arcade-style controls for its tablet PC. Hideyoshi Moriya used some clever circuitry and some trusty cardboard to cobble together his mini iPad arcade unit, which shows the possibilities for – we hope – a major commercial gaming organisation to follow suit and bring such a peripheral to market. ThinkGeek posted this iPad arcade cabinet as an April Fool's joke earlier this year, but it clearly inspired Moriya to build something that actually can control iPad games with a joystick and buttons via an Arduino board.